A large area of showers and storms have developed across the Bay of Campeche and southwestern Gulf of Mexico. This area of low pressure has formed on the tail end of a cold front. A surface circulation is apparent and more than enough deep convection is associated with it to classify this as the next tropical depression. There is a chance that it will become a tropical storm before making landfall in northeastern Mexico. 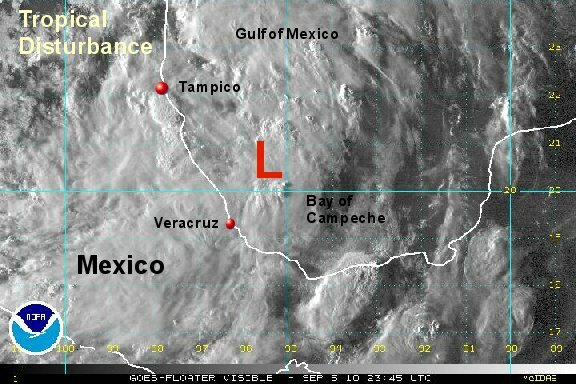 As of 7 pm cdt the tropical disturbance was centered roughly near 20.5 N / 95.5 W or about 200 miles southeast of Tampico, Mexico. Top sustained winds are estimated at 35 mph. Movement is northwest at about 5 mph Pressure estimated at 1003 mb. Interests on the northcentral and northeast coast of Mexico should follow this system. Forecasts take this system north northwest into the northeast coast of Mexico over the next 1-2 days. Deep convection has built sufficiently to name td 10 a tropical storm. We agree with the hurricane center that top sustained winds are probably now close to 40 mph. We are differing on the placement of the low center and have it farther northwest. Hermine will have a short life as it is expected to be over land tonight. 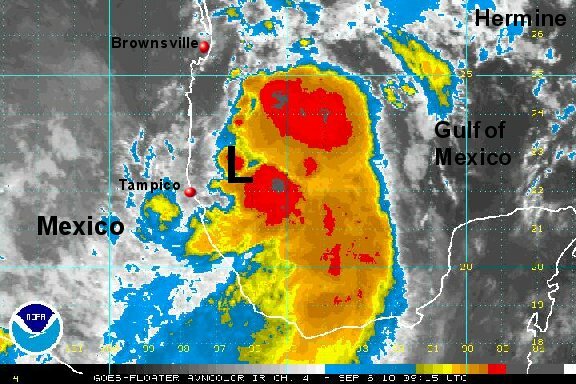 As of 6 am cdt tropical storm Hermine as centered near 22.5 N / 96.4 W or about 90 miles east of Tampico, Mexico /240 miles south southeast of Brownsville, Texas. Top sustained winds are estimated at 40 mph (NHC 40 mph). Movement is north northwest at about 8 mph Pressure estimated at 1001 mb. Interests on the northcentral and northeast coast of Mexico and south Texas should Hermine. Forecasts take this system north northwest into the northeast coast of Mexico and extreme south Texas by tonight. Hermine has strengthened today and recently has turned northwest. With the pressure at 995 mb we are estimating winds a little lower than the hurricane center. Hermine is now moving northwest and is about 50 miles east of the Mexican coast. It should make landfall later this evening in roughly six hours about 100 miles south of Brownsville. As of 2 pm cdt tropical storm Hermine as centered near 24.1 N / 97.0 W or about 135 miles south southeast of Brownsville, Texas. Top sustained winds are estimated at 55 mph (NHC 60 mph). Movement is northwest at about 14 mph Pressure estimated at 995 mb. The radar presentation is excellent on Hermine's position. It is just off of the Mexican coast and will make landfall within the next 1-2 hours in a sparsely populated area. Doppler radar estimates in bands over northeast Mexico / south Texas are in the 2-3 inch range. Some totals may be over 5" as Hermine moves deep in the heart of Texas during the next 2-3 days. 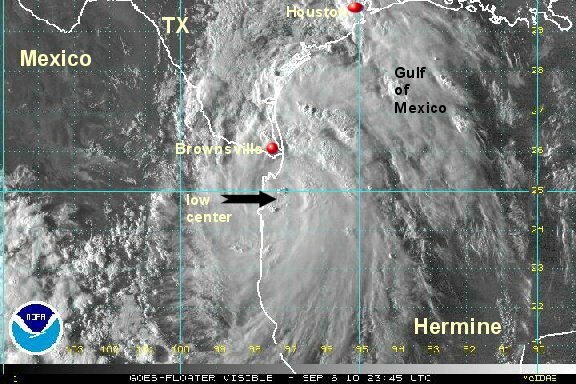 As of 7 pm cdt tropical storm Hermine was centered near 24.8 N / 97.1 W or about 80 miles south southeast of Brownsville, Texas / 25 miles east of the Mexican coast. Top sustained winds are estimated at 65 mph (NHC 65 mph). Movement is northwest at about 14 mph Pressure estimated at 991 mb. This will be our last update on Hermine since landfall will occur shortly. 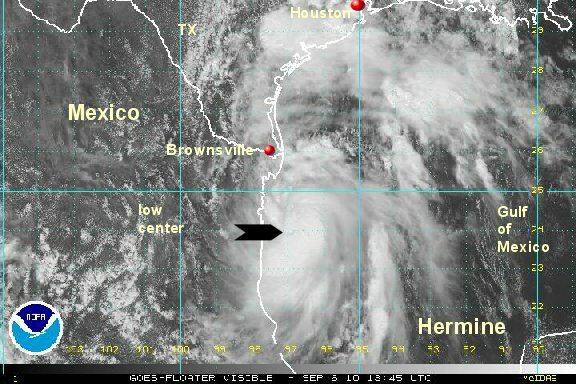 Hermine has a classic "eye" structure in south Texas this morning. Rainfall amounts from doppler radar estimated some totals near 5" in south Texas with over 10" offshore in large slow moving rain bands. Winds gusted to near hurricane force at Harlington, Texas as a squall band moved through last night.